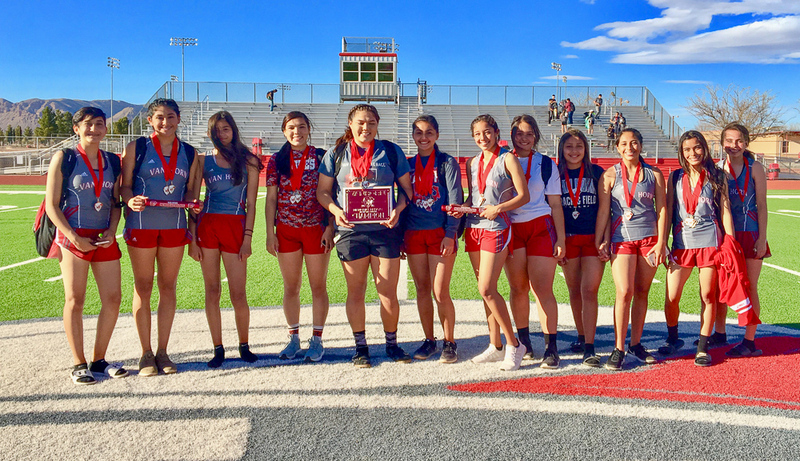 The Van Horn Eagles hosted their annual Memorial Relays last week. The Lady Eagles finished first overall scoring 198 points to take the team title. The Lady Eagles won 2 out of the 3 relays. The team of Cyrenee Tarango, Jadein Tarango, Valerie Felix and Desirae Duran won the 4×100 relay in a time of 54.42. The team of Mariah Morales, Ninel Flores, Iris Urias, and Desirae Duran placed 1st in the mile relay taking 3.5 seconds from last week. Also winning gold in individual events were Ninel Flores in the 800m and Jadein Tarango in the shot put and discus. The Lady Eagles placed in every event entered in the meet. This is the Lady Eagles 1st team championship after placing 3rd in Sanderson and 2nd in Ft. Stockton. In the boys division, the Eagles placed 2nd overall scoring 130 points. Wink was the team champion. The Eagles won 2 out the 3 relays. The Eagles ran their best time of the year 800 relay taking home the gold medal with Kristian Robb, Juan Ramirez, Rudy Estrada, and Omar Vasquez. Also the 400 relay placed 1st , with Kobe Ramirez, Juan Ramirez , Rudy Estrada and Omar Vasquez. Receiving silver medals were: Nathaniel Arrazate-800m, Emilio Tarango-discus and the mile relay-Vasquez, Dominguez, Robb, Arrazate. The Eagle track team will take a week off for Springbreak but will participate in the Fightin’ Buck Relays on March 24 in Alpine, TX.